In this session you will use your startup costs and expenses from Session 7 to build a Startup Funding table. You will also learn about ways to finance a new business, and what works for what kinds of startups. Most startups are self-financed (called “bootstrapping”). A study made by Wells Fargo bank (2005) showed the average cost to start a business in the U.S. is $10,000. Owning a business yourself or having partners. If you can own it yourself, then you’re probably better off, unless you want to have partners to reduce risk and to bring in know-how and experience. The amount of startup costs will depend on the business. For example, there may be little or no startup costs for a catering company or a portable lunch stand. The startup costs will be much higher for a high-end restaurant in a major urban location. The need for funding depends on these costs. Types of funding for a startup can depend on how much money is needed, whether the investor feels there is a good rate of return from their money, and whether the company agrees with the terms. More than 500,000 new businesses are started in the U.S. each year. Only about 5,000-6,000 receive venture capital per year. Angel investors must qualify according to the SEC rules. Research has shown there are more than 200,000 angel investors in the U.S.
Getting funding from friends and family should be limited. There are a lot of legal restrictions. This type of funding might work for tens of thousands of dollars, in some cases hundreds of thousands. Angel Investor: A person who invests his or her own money in a startup business who meets the SEC guidelines. Bootstrapping: Starting a business by yourself, with no outside investors, with or without bank loans, credit cards or other borrowed money. 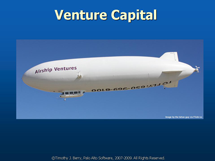 Venture Capitalist (VC): A person or firm that makes business investments. A VC can also bring management and technical knowledge as well as money. These resources provide ideas from other business and marketing experts. They are not required reading for this session. Five Alternate Sources of Financing, from the Wall Street Journal. This speaker has been on both sides of the funding table. One of his ventures is epinions.com. He also has a blog called Venture Hacks. Most of what he says here is pretty standard. And if you’re interested, his fellow blogger transcribed this interview on venture hacks. This speaker is an entrepreneur and an investor. Here he talks about what investors want to know, and what they want to see in a pitch. If you don’t see the video here, you can click this link to go to the source video on the TED site.